This article is about the giant metal shapeshifting aliens with psychological defects. For the electrical device, you're probably on the wrong wiki. A typical transformer enjoying a daily walk; free from the tired-ness of driving. For those without comedic tastes, the so-called experts at Wikipedia have an article very remotely related to Transformers. 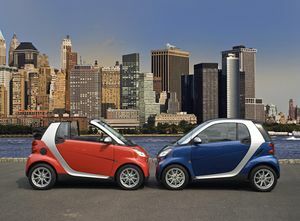 Transformers are members of a race of sentient robots from the planet Cybertron who were exiled to earth in 1984. They are most notable for changing their appearance and form so as to resemble machinery. This modification of their metal bodies in appearance to be attractive and powerful Earth vehicles has been likened to the human usage of tattoos, body piercings and implants to fit in with other individuals who also have low self esteem. While transformation was in vogue on Cybertron for a short time (see below), the vast majority of Cybertronians (known colloquially as the Puritanicons) do not change their appearance. These "pillars of the community" look down on those that choose to and the term "Transformers" came into vogue as derogatory term referring to any robot who disguises their true self through body modification techniques. Transformers slowly became excluded from polite society, saw a loss of Facebook friends, until finally they were barred from holding public office and forced to work in super discount chain stores outside the normal boundaries of the cities. This eventually resulted in the exile of the Transformers from Cybertron to Earth; an error primarily due to a malfunctioning navigation unit used during travel. The sickening sight of two children emulating their "heroes" in a common parade when such events were at their peak. Whilst the Earth had the shameful history of their Minstrel Shows, Cybertron had the equally damaging Transformers Parade. These events would showcase up to a hundred transformers, fully transformed, performing in formation for the speculation of an eager public. Long since seen as an embarrassing exploitation of the lower classes, the final shows were last performed over twenty years ago. Since its Heyday, transforming has been considered a pastime of the lower classes and the deviant elite on Cybertron, and thus only individuals with low self-esteem and other psychological issues pursue this radical course of action. The issues that result in a Cybertronian becoming a Transformer are many and varied, but some of the more common are detailed below. Unlike those who have the ability to change shape into whatever they wish on the drop of a dime (shapeshifters or transmorphers), the transformers can only switch between pre-rendered mechanisms and their original shape. Thus, many transformer robots have developed emotional issues and mental complexes, due to their feelings of inadequacy when compared to the superior abilities of a shapemorpher. Some transformers (notably Optimus Prime, Bumblebee, and others), have very bad self esteem, which they normally show by listening to Music which allow them to express their feelings and feel like they are no better than common automotive vehicles. This was the original reason that their alien race migrated to Earth, in order to punish themselves. Once here, they battle each other in order to injure and maim themselves until they are bored, leaving Earth as a ruined wasteland. Ratings week always brings out the worst in a show. Unfortunately, most of these issues cannot be solved simply by re-building your body from the ground up, and most transformers eventually end up seeking self-worth by taking the path of either a Decepticon or an Autobot. 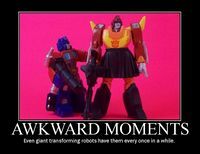 While it is possible to switch from one group to the other, most Transformers find some kind of acceptance in these social groups and are reluctant to move away from what is effectively a surrogate family. ~ Barrack Obama on his pending Decepticon assimilation. Decepticons (lit: ‘’Not a pretty picture’’) blame the universe for their apparent insignificance, and seek to destroy or enslave the entire universe in revenge, though due to the current economy they would be happy to settle for dominion over Earth and/or Cybertron. Because of their insecure nature,warlike personalities and general lack of diplomatic or social skills, they are susceptible to infighting and betrayal, and their greater purposes are often thwarted by petty disagreements and leadership struggles. Long time leader of the Decepticons due to his great size and strength, Megatron seeks to account for his own insecurities by conquering the Earth and grinding the human race into submission. He is regularly thwarted by Optimus Prime, and in a classic case of sibling rivalry, is driven by an all-consuming rage to destroy him and the Autobots for all eternity and be recognised as the greatest of all Transformers by anyone and everyone left alive. A fearsome fighter in his own right and Megatron’s second-in-command, Starscream seeks recognition and respect from his fellow Decepticons. This causes him to regularly attempt to undermine and supplant Megatron, which in turn results in his losing position amongst the Decepticons. This is a classic case of a self esteem spiral. The Autobots (lit. ‘’self-workers’’) seek to attain self-worth by gaining the adulation and approval of humankind and other Autobots by protecting civilisation from ‘evil’, which mostly means fighting the Decepticons. The autobots in the main part recognize that for them to remain the adored heroes of humankind (many of whom are still utterly unaware of the existence of the Transformers at all) in the long term, they must defeat but not destroy the Decepticons, allowing them to save the day again in the near future. Sadly, this also results in low job satisfaction due to never making progress in their fight. 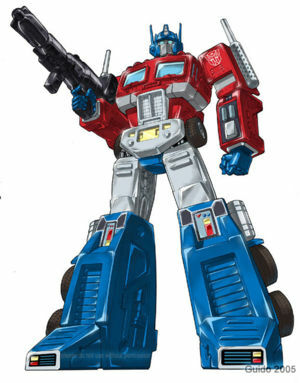 Despite being universally recognised as the best and brightest of the Autobots, the last hope of humanity and being able to transform into the kind of truck that every six year old boy dreams of driving, Optimus Prime still suffers from an inferiority complex that causes him to hide as much as possible while on Earth, sacrifice himself at each and every opportunity, and make long boring speeches about truth, justice and the American way of life. Other Autobots find him incredibly obnoxious, but hang around him anyway because he is popular with the ladies, mechanical and otherwise. 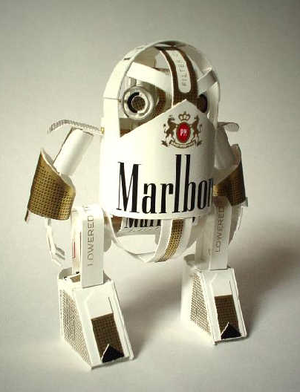 TV audience favourite “Marlbot” in a rare public appearance. Decepticon names like Starscream and Megatron inspire fear wherever they go, some Autobots with cool names like Ironhide and Optimus Prime are universally respected, and some poor Autobots obviously suffer from having been loathed by their parents. If robots have parents. The Autobots themselves seem to be reluctant to talk about the matter in front of humans, and the Decepticons aren't really into talking. Not only does Bumblebee have the least manly of all robots in the history of the universe, he's also colourblind and has no idea that he is actually bright yellow, which is probably just as well. 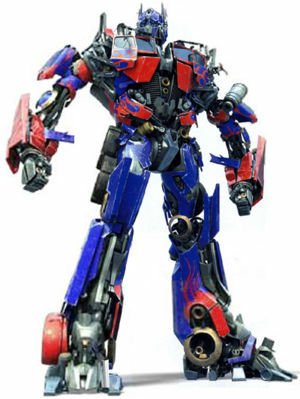 ~ Barrack Obama on Speculation that Marlbot and numerous other Autobots would be awarded the Nobel prize. 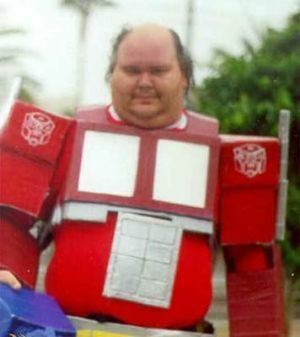 One Autobot who has captured the admiration of audiences worldwide is Marlbot, whose constant campaigning on health issues such as Lung Cancer awareness and reluctance to fight everything in sight is tipped to win him the Nobel peace prize in 2014. In 1984 a small religious oriented Japanese toy company converted their line of Nascar and military related cigarette lighters into a line of child teaching aids to mock these so called "Trans-formers." After several unfortunate child deaths, the Japanese government stepped in and removed the butane based flame source and required additional safety measures be implemented in order to protect children. The popularity of the "mini-bots" exploded as the newly safe toys (re-marketed with a diversity theme) were sold to the public at a reasonable price point. Decepticons take no interest in the feeble entertainments of measly humanity, but when they are rulers of all the universe humankind will pay for the harsh portrayal of Starscream as being that misshapen and for calling action figures ‘dolls’. While the Autobots in general were overjoyed by what they saw as recognition from humanity for their hard work rather than simply a commercial opportunity well exploited, many Autobots were disheartened by their low sales compared to those of Optimus Prime, Bumblebee and Megatron. The transformers figurines were used as an example of cheap foreign-made goods flooding the world market in the Nobel Peace prize acceptance speech of US president Barrack Obama, who identified overcommercialisation the greatest challenge of the western world in the 21st century. Autobots and Decepticons alike were reported to be devastated by the reaction from the President, whom many had considered an example of the changing prejudices of a society that might some day come to love minority groups like alien robots as it has embraced African Americans. Emerging the same time as the 'action figures', the Transformers animated series did well amongst the human audience in both the US and Japan, but drew derision from Cybertron for glorifying what was now a taboo subject on the planet, from the Decepticons due to the sad inability of their animated avatars, like themselves, to attain victory over the Autobots, and from the Autobots because they weren't approached to do the voice acting. Despite, or perhaps because of this outcry, the TV show continued to do well, running to many series and producing many sequels and spin-offs, and even a series of comic books. The Transformers did not receive any royalties for the usage of their names or adventures, and as they were illegal aliens they had little to no recourse in a court of law. There are three movies of the Transformers franchise: the 1986 movie, the 2007 movie obviously named as Transformers and the sequel, known as Transformers: Revenge of the Fallen, which sadly did not go to plan and the bots took over. The 1986 movie explained to the 2006 crowd. This page was last edited on 21 March 2019, at 15:38.